Lighthearted Locavore: Digging this Garden! While on my mid-Atlantic Spring Break Trip with the family, I bowed out of our week-long site seeing extravaganza to attend a meeting at the United States Department of Agriculture in Washington. It was a planning meeting for the United Nations Commission on Sustainable Development Civil Society Stakeholders and colleagues from the USDA and the State Department who are focused on sustainable development issues (I'm a member of the NYC Host Committee for UN CSD-17 which is a two week conference in New York on May 4-15 -- more to follow later on CSD). 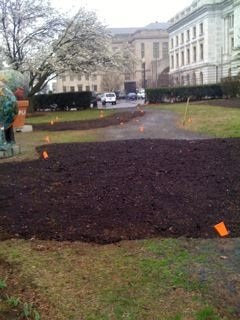 Besides being a productive and informative business meeting, I got to see the USDA's brand new "People's Garden". Sorry -- couldn't get close enough to the White House to snap a picture of their new veggie patch but did get the dirt on the USDA garden. 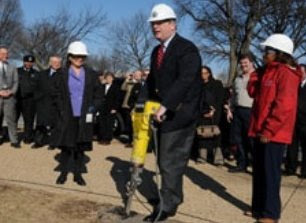 As most dedicated locavores know, on February 12th, the bicentennial of Lincoln's birth (Lincoln founded the USDA in 1862), Tom Vilsack, the Secretary of Agriculture, broke ground on a 1,250 square foot community garden right in the middle of the USDA grounds. I suspect most people have only seen photos of Vilsack with a jackhammer breaking through cement so I took a picture of the super rich topsoil gardens just waiting to be planted (reportedly with fruit and veggie seeds and pollinator friendly flowers) using my iPhone -- a pretty good photo, I will add. At the groundbreaking, Vilsack promised to support a community garden at every USDA site across the country. These community gardens are intended to not only showcase good practices for land management and water conservation but, according to the USDA press release, also to be a role model of sorts for Americans across the country to "implement their own backyard and green spaces". An important symbolic gesture signifying the new administrations commitment to America's agrarian roots, I wholeheartedly approve! While they don't seem to have a lot of concrete plans (pun intended) over there at the USDA about this garden, I do know I was pretty excited to see for myself that there are 1,250 square feet more of rich, brown fertile dirt in Washington than there was during the Bush Administration. Dig that!